The sacroiliac joint (SI joint) is where the bones of the spine connect to the pelvis. There is one joint on the right side and one on the left. These joints are held together with strong bands of fiber called ligaments. The SI joint has little movement. Its main job is to decrease impact to the spine during activities like walking. Problems in this area can cause pain in the lower back which may also pass into the groin or down the legs. If needed, the doctor may use a nerve block to make sure the pain is coming from the SI joint. Medicine that blocks pain is injected near the SI joint. If pain stops, then the joint is confirmed as the cause. Treatment depends on the cause of the pain. Any underlying condition would receive treatment specific for that disease. For all causes, short-term rest is often the first step to allow time for the joint to heal. Chronic low back pain. EBSCO DynaMed Plus website. Available at: http://www.dynamed.com/topics/dmp~AN~T116935/Chronic-low-back-pain . Updated May 23, 2018. Accessed June 4, 2018. Cohen SP. Sacroiliac joint pain: a comprehensive review of anatomy, diagnosis, and treatment. Anesth Analg. 2005 Nov;101(5):1440-1453.
d'Hemecourt PA, Gerbino PG II, et al. Pediatric and adolescent sports injuries: back injuries in the young athlete. Clinics In Sports Medicine. 2000 Oct;19(4):663-679. Dreyfuss P, Dreyer S, et al. Positive sacroiliac screening tests in asymptomatic adults. Spine. 1994;19(10):1138-1143. Inflammatory arthritis of the hip. Ortho Info—American Academy of Orthopaedic Surgeons website. Available at: http://orthoinfo.aaos.org/topic.cfm?topic=A00396. Updated July 2014. Accessed June 4, 2018. 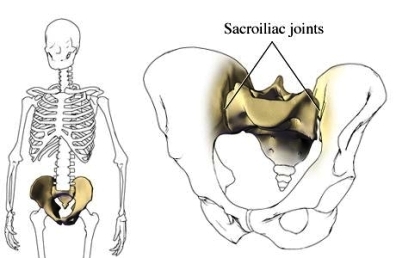 Sacroiliac joint dysfunction. Orthogate website. Available at: http://www.orthogate.org/patient-education/lumbar-spine/sacroiliac-joint-dysfunction.html. Updated December 10, 2017. Accessed June 4, 2018. Sciatica. EBSCO DynaMed Plus website. Available at: http://www.dynamed.com/topics/dmp~AN~T115166/Sciatica . Updated April 20, 2018. Accessed June 4 ,2018. Scopp JM, Moorman CT III. The assessment of athletic hip injury. Clinics In Sports Medicine. 2001 Oct;20(4):647-659. Speldewinde GC. Outcomes of percutaneous zygapophysial and sacroiliac joint neurotomy in a community setting. Pain Med. 2011;12(2):209-218. Spinal injections. Ortho Info—American Academy of Orthopaedic Surgeons website. Available at: http://orthoinfo.aaos.org/topic.cfm?topic=A00560. Updated December 2013. Accessed June 4, 2018.
van Benten E, Pool J, Mens J, Pool-Goudzwaad A. Recommendations for physical therapists on the treatment of lumbopelvic pain during pregnancy: a systematic review. J Orthop Sports Phys Ther. 2014;44(7):464-473,A1-15. Available at: http://www.jospt.org/doi/pdf/10.2519/jospt.2014.5098. Accessed June 2, 2016.